Lakewood, NJ - Marilyn Berenzweig was a successful New York textile designer who loved her work and comfortable lifestyle. For the past year, however, she and her husband have been living in a tent city in the New Jersey woods. “The weather, the bugs, the dirt; I think it’s the dirt that really gets to me,” she said. “It’s not like you can pop in the shower at the end of the day. Berenzweig, 60, and husband Michael live at Tent City Lakewood, a growing community of 70 homeless people living in a series of tents, shacks, trailers and tepees in a wooded area along the Jersey Shore about 25 miles north of Atlantic City. When they first lost their home, they tried living with their daughter, son-in-law and three grandchildren. “It didn’t work out ... too many clashes of temperament,” she said. Their son-in-law drove them to the camp 16 months ago. Other than telling their daughter, they’ve kept their whereabouts off Ocean County Parkway a secret from family members. Berenzweig said she’d first heard about tent cities from her friends. “A friend of ours had mentioned tent camps earlier, thinking it was disgraceful what this country came to with economics being so bad at the time,” she said. She never imagined she’d soon be living in one. Berenzweig and her husband’s makeshift home is a wood-framed shack covered with a tarp and blankets. They’ve created a patio of sorts with blue tarp hanging over a series of plastic chairs and tables. Underneath the tarp are signs of everyday life: a propane fueled stove, dishes, a dictionary, cooking utensils, a coffee mug. Their patch of land has a chicken coop on it and a wood stove to be used during the harsh winters to stay warm. A shopping cart is full of wood and paper to be burned in the stove. They brought their cat and birds to live with them, remnants of the life they once had. They’ve adjusted to being labeled homeless, but some parts of having nothing are more difficult to handle. Berenzweig’s circumstances aren’t unique. The rocky economic recovery and stagnant unemployment rate have led to a surge in the homeless seeking shelter in shanties and tents nationwide, experts say. The modern-day Hoovervilles have names such as Dignity Village or Pinellas Hope or simply Tent City 1. There’s no official estimate on how many tent cities exist but, experts say, nearly every state has one and the presence of such communities is soaring. Stoop and his organization began formally tracking tent cities in 2010 but the numbers have grown so much that trying to keep a detailed report of every tent city has overwhelmed them. “Imagine if you had never been homeless before and you’d just lost your job and you lost your home,” he said. “What would you do? Would you immediately go begging or knocking on a door? “No, you would downsize, move into cheaper accommodations, if that did not work you’d move in with friends or relatives and then you’d move into a cheap motel and then ... where would you want to go before winding up at a shelter door? You would much prefer to live at a park with your family and your dog,” he said. The communities range from just a few people living together in tents or wooden shelters to full-fledged organized communities such as the one in Lakewood. Just a few homeless people began gathering in the woods there in 2005, but as the financial meltdown worsened, their numbers grew. Steve Brigham, a pastor, has been working with the community since it began forming. Two years ago, he quit his job as an electrical contractor and now lives with the homeless in the camp. He lives in a bus donated to him from a local school. “I wonder to myself how long I can continue with the population growing, resources dwindling. ... I’m very concerned about this winter, extremely concerned about ... whether I’m going to have everything I need to keep these people satisfied and comfortable and the basic needs met,” Brigham said. Brigham helps welcome and support newcomers. He supports the community as a whole, seeking donations and services for the needy. He also is the pastor of the tent’s chapel, a wood structure that he built. New Jersey, as with much of the nation, has no right to shelter. 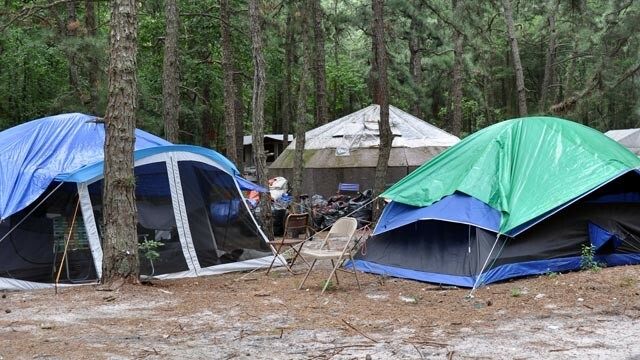 For the past year, Tent City Lakewood has been fighting a lawsuit filed by the township and county to evict them from the woods. As part of the pending litigation, Brigham and the community have to take down the chapel and 14 other structures at the camp by next week. “For somebody to say that you’ve got to tear down the housing that’s going to keep them warm and they don’t offer an alternative or an option, it’s extremely disheartening,” Brigham said. Lakewood and Ocean County officials did not respond to requests for comment from ABCNews.com. Jeffrey Wild and his law firm, Lowenstein Sandler, have been working pro bono to help the community counter the lawsuit. They’re fighting for a shelter or affordable housing to be built for those living in the tent city. Experts say that local and state governments are often ill equipped to handle tent cities. On top of the legal violations, the tent cities make poverty uncomfortably visible to some members of the public, raising fears, sometimes unfounded, about depreciating home values and crime. “There’s the, ‘not-in-my-backyard phenomenon,’ no one likes to acknowledge that homelessness is a big issue,” attorney Wild said. Berenzweig said the community complained when Berenzweig and her husband first moved to Tent City Lakewood, which is difficult to see from the parkway. Berenzweig said she thinks the tent city should be a source of pride for Ocean County, which has no homeless shelter. What is "ocean county parkway"? Who would imagine that in 2011, Yidden in the USA would be homeless, and living in tents! A shanda! What does that mean? These are desperate people -- show some respect (and perhaps, apathy), please. Ribbono shel olam my heart cries and my eyes weep! "Me and my law firm ... are trying to fight for the right of the people in this tent city and everyone in New Jersey to have a right to shelter when you have nowhere else to go,” Wild said. Maybe they should think about getting a different lawyer - one who speaks proper English. Solution, get that slum lord, Chris Christie to build a homeless shelter. I don't really know if it is the government's responsibility to give them housing or not, but it's pretty cold to try and move some people who have a small community just because you don't like the look of it when you drive down the road. Instead of paying lawyer's fees, the city could instead give them some food, support, or rent-controlled housing. People are loosing jobs and have no money. What are they supposed to do? Whatever happened to the responsibility of a community to take care of those in need. Would Hashem prefer if we used our extra money for luxuries or to give some tzedaka and help another in need? So they had a big family fight and their daughter kicked them out of the house and then their son-in-law dumped them at the homeless camp. That's extreme. These people should go on Oprah or the Jerry Springer show. My husband had a stroke and didn't work for two years. He was 31 with four children newborn- age 6, no disability insurance and the rehabilitation therapy was not covered by our health ins. Our savings were gone in a few months. We lost our house and everything in it. If not for the goodness and kindness of the community, we would have also been homeless. Most of the 60 year olds I know have lost their savings just trying to survive. Most of them also have children and grandchildren living with them. All of us are only a job loss, major illness or disaster from being homeless. I find that outrageous. How can family allow their own to just find shelter in a tent- and the govt must get their corrupt heads out and build real shelters. What a shanda that illegals get more rights than its own citizens. “ Ribbono shel olam my heart cries and my eyes weep! “ You have to wonder? You have stated a fact that America's do not want to view as possible. Not even the cities and towns. You see, they need all the employee's to believe that the retirment system they now have is good. If they see the truth, they will get scared and wonder where or if their funds are safe. They are not, reason. They have never been funded to the degree of self funding. The moneys have been stolen or redirected to other programs. Thinking that the next group of employee's would being contributing for them. This is not happening. Towns are cutting back, thus the work force that is supposted to contribute is not. Thus leaving a gap. You will see it speed up in the coming months. 2012-2013. The money is not there. We are headed off the cliff, we have politicians that do not want us to look. Its bad, really bad.